Players of the new game cleaned up Peterborough, Ont. by picking up and disposing of litter during an organized event on Sunday. The litter pick-up route. (Facebook)Just before the Cross Country Checkupconversation on digital friendship started on Sunday, Pokémon Go players in Peterborough, Ont., were hard at work and play. They were picking up litter around the city while playing the popular new app. Jessica Correa was one of the organizers of the garbage pickup, and she said that the event vastly exceeded her expectations. "The event exploded on social media locally," she said. "[The game] was a great incentive; we had tons of people come out." The game itself involves a lot of walking; players amble around the real world searching for fictional animals, called Pokémon, to catch, or to collect items at Pokéstops, and to hatch eggs, all using augmented reality software. Correa said all this walking was making players see how much garbage there was lying around. "[Players] have been getting outside more and noticing these eyesores." 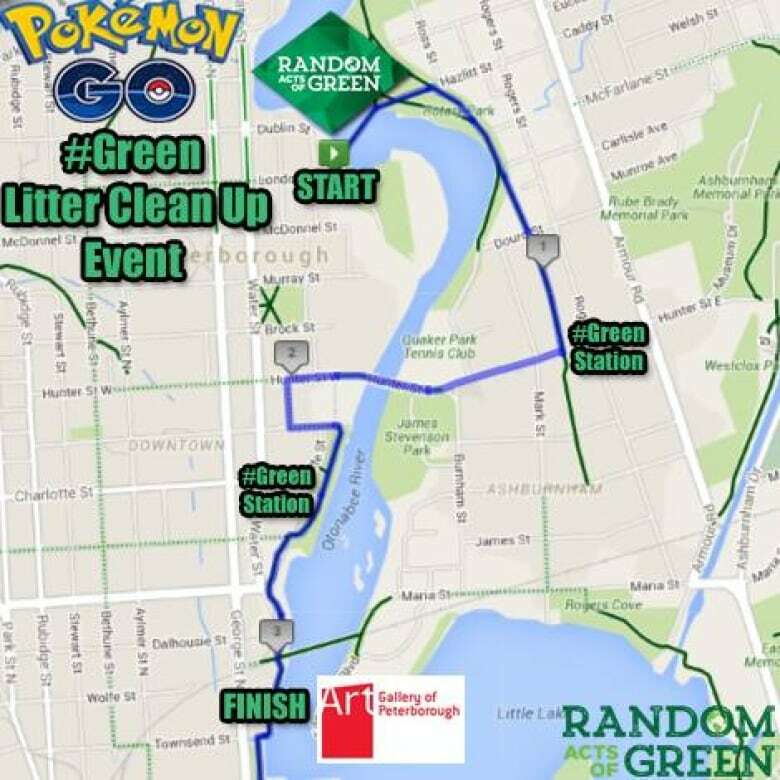 In other cities, there have been complaints of garbage accumulating due to Pokémon players, and the suggestion that these players are contributing extra garbage. Regardless of the cause, a couple of Peterborough players decided to organize a garbage cleanup, and brought Correa and her company on board to help organize. They idea was that "people could walk, catch Pokémon, and pick up litter," said Correa. In just a week, they arranged for several local business sponsors, set up garbage deposit stations along a designated route, and had dozens of people turn out on the day of. Check out the full episode from July 24, 2016 here.